In case you have already made your way through your stack of new-reads acquired over the holidays, I would encourage you to track down a copy of Slow Food Nation, a wonderful read that does not seem to be getting the attention I think it deserves. I picked this book up on a whim when I was present-hunting just before Christmas and it is an incredibly well-written book by Slow Food’s founder Carlo Petrini. For those of you not familiar with Slow Food, the organisation’s mission is to “defend biodiversity in our food supply, spread taste education and connect producers of excellent foods with co-producers through events and initiatives.” Today the organisation counts over 100,000 members across the globe who, among other things, are active in seeking the protection of traditional foods, set up tasting seminars and work with those in the food industry to encourage them to source locally grown food. Rather refreshingly, there is no preaching involved in Petrini’s book as to what we should or should not eat. Rather, Petrini provides numerous examples of traditional foods that have already disappeared or that have nearly disappeared and the devastating impact that can have on wildlife, the environment and the economy (in addition to the disappearance or deterioration of dishes traditionally prepared using those products). It quickly becomes clear then why the food we choose to eat should be “good, clean and fair” (and in the book Petrini explains what those three words mean in practice). Eating food that is good, clean and fair to Petrini is not just about the taste of our food but, more importantly it is the key to maintaining biodiversity, protect the environment, support local economies and ensure everyone on the planet is adequately fed. What I am enjoying in particular about the book is its global approach – rather than focus on one particular region (like many books on similar topics do), Carlo Petrini looks at the planet as a whole, looking at organic agriculture in the US, prawn farming in India, pepper growing in Holland or tulip-farming in Italy, among many others. 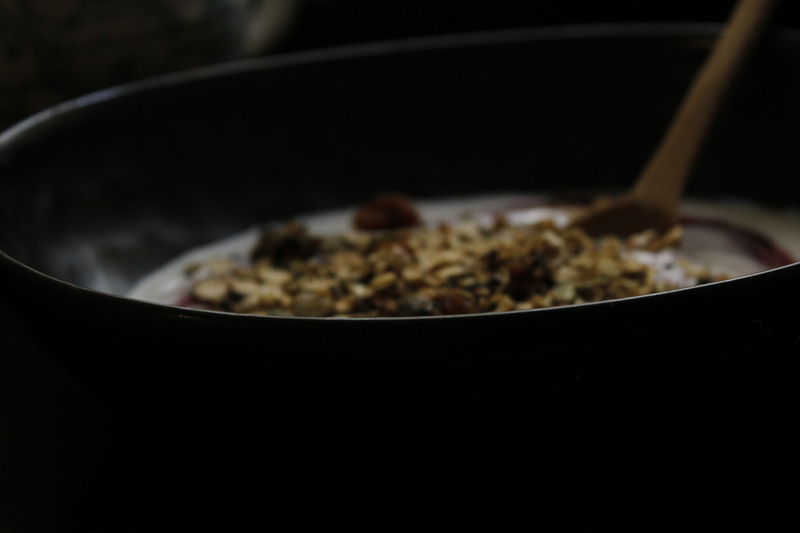 And as much as I have been enjoying this garam masala and coconut granola for breakfast ever since getting back from Germany, what I really want to talk about is the genius idea of making stove-top granola, the inspiration for which I have my mum to thank for. The Scottish among you will be familiar with Cranachan, a sweet dish composed of toasted oats (soaked overnight in a little whiskey), whipped cream, honey and fresh raspberries. My mum often made something similar when I was little, although she used to caramelize the oats ever so slightly by mixing them with a little sugar before toasting them in a dry pan (and leaving out the whiskey). Now that I no longer live at home I often use this technique, using not just oats but any other grains, nuts and seeds I have to hand to make what I like to call stove-top granola. As there is no need to wait for the oven to heat up it is wonderfully quick, it is perfect if you just want to make a small batch of granola and you can keep an eye on it the entire time it cooks to make sure it does not get any darker than you want it to be (it is also fat-free in case that is important to you). In short, I may never go back to making granola in the oven. Makes ca. 750g, enough to fill a 1 litre mason jar. While I have been sneaking a spoon of the granola every time I amble into the kitchen, the granola tastes even better scattered over my favourite smoothie bowl (a frozen banana and a handful of spinach thrown into my food processor with just enough milk to have a smoothie with the consistency of kefir) and some fresh pineapple or mango chunks. 1. In a large saucepan mix together the oats, puffed kamut, buckwheat groats, sesame seeds, pumpkin seeds, linseeds, poppy seeds and coconut flakes. In a separate bowl briefly whisk together the garam masala with the muscovado sugar and sea salt flakes. Add to the saucepan and stir to combine. 2. On a medium flame heat the nuts and seeds until the sugar start to melt. Stirring continuously wait until the nuts and seeds mixture starts clumping together and smells toasted (being careful not to burn any of it). Set aside to cool. 3. Stir in the chopped dried fruit and add a further sprinkle of sea salt flakes or garam masala to taste. Store in an airtight container. This is wonderful Sophia, sounds absolutely delicious and I love that you made it on the stovetop. I really love cranashan also! 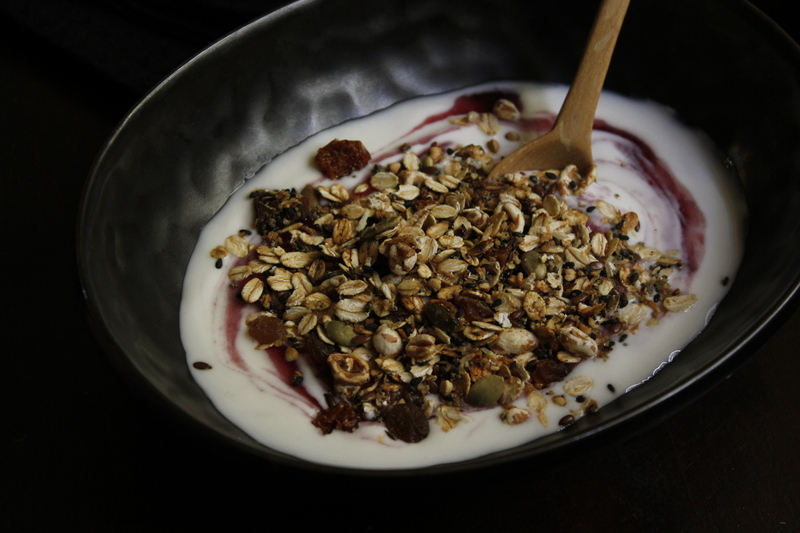 Thanks Suzanne – I love that it’s so quick (especially as my old oven takes over 30 mins to pre-heat) and that you can make small servings (I have been known to make single servings when a granola craving struck!). 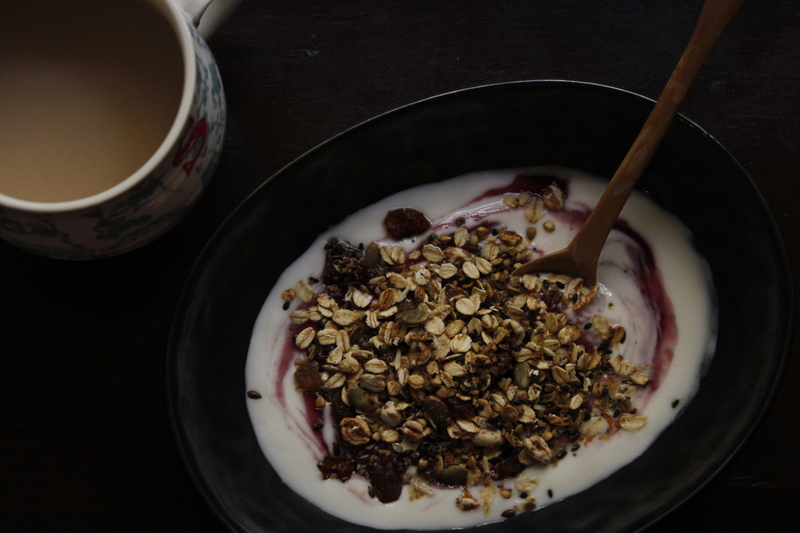 This is lovely, and looks so simple – perfect to satisfy my granola cravings without baking a huge batch that would feed ten people. Also, I’d never thought of making granola with garam masala, which I tend to associate more with savoury dishes…so that will be an interesting experiment to make! Thanks Iris. Until recently I had only come across garam masala in savoury preparations as well but now that I have started using it more in sweet dishes as well there is no going back. Used in moderation (if not the cumin comes through too much for my liking) I think it has a wonderful flavour that works really well with wholegrain flours and brown or muscovado sugar – its spiced without screaming pumpkin pie or gingerbread, so great year round. If you want to try other garam masala recipes, there is a recipe for a garam masala spiced Couronne on the blog and Heidi from 101cookbooks made a delicious-sounding loaf cake a while ago. Wow, I would never have thought to add Garam Masala to granola. Im very intrigued by this, it sounds like something I might love, I’ll definitely have to try it out 🙂 I love the sound of that book too, thanks for the recommendation! I think Garam Masala isn’t for everyone but I love it and have been using it more and more in sweet preparations. 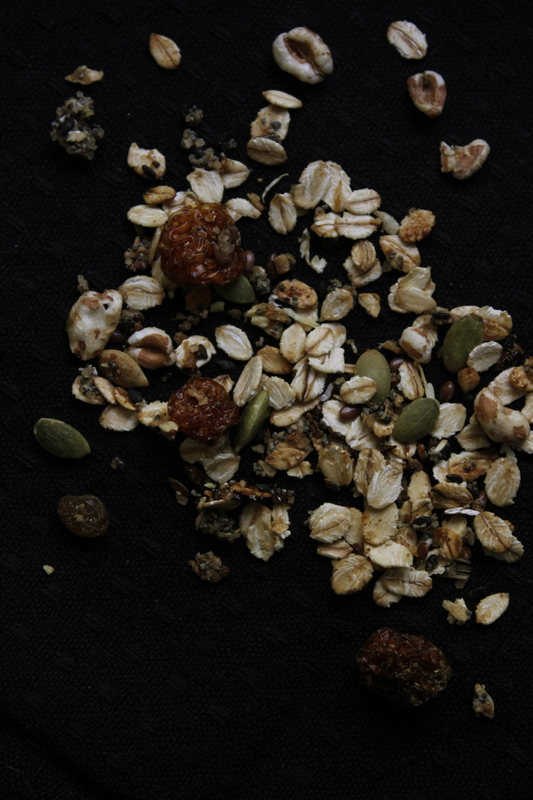 LOVE that second to last shot of the granola! So dark and dramatic. And, like the commenters above me, I’m so impressed that you experimented with garam masala. I bet it’s delicious. Thank you, your comment just made my day! Garam masala is jot for everyone but I really like it in sweet preparations. A while back I made a couronne filled with melted butter, sugar and garam masala which I loved (https://realsimplefood.wordpress.com/2013/10/14/garam-masala-couronne/). On twitter someone recently mentioned garam masala ice cream which I now can’t get out of my head … And Heidi from 101cookbooks made a pumpkin loaf with garam masala a while back which I quite like the sound of … Plenty more sweet garam masala recipes to experiment with – let me know if you give any of them a try sometime!